He created more than 2,000 works, including 900 paintings, three of which make up the world’s ten most expensive pieces of art. Van Gogh was born in 1853 in Groot-Zundert, a village in the southern Netherlands. His father was a minister and three of his uncles were art dealers, two vocations that were to pull Vincent in different directions at various times in his life. In letters, Vincent has described his youth as “gloomy, cold and barren,” and he left school at 15. With the help of his uncle, he was offered a job with the art dealer Goupil & Cie, and in 1873 was sent to London and from there to Paris. After complaining repeatedly about the commoditisation of art, his job with the art dealership was terminated and Van Gogh returned to England to work as a teacher and minister’s assistant. In 1879, after failing a course at a Protestant missionary school near Brussels, Van Gogh began a mission in the poor mining district of Borinage in Belgium. Choosing to live in the same poverty-stricken conditions as the local population, he was dismissed for “undermining the dignity of the priesthood” and returned home. His behaviour over the following months led his father to enquire about having Van Gogh committed to an asylum. 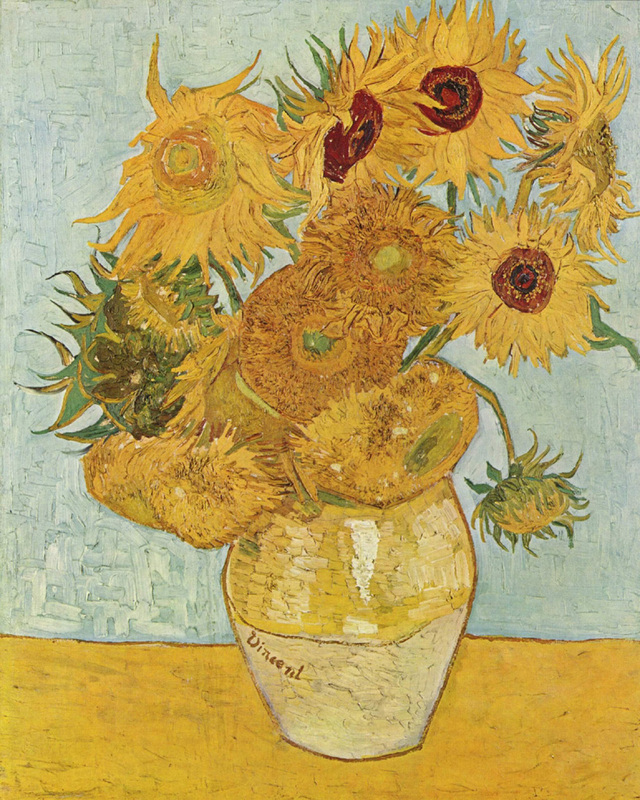 Aged 27, Van Gogh eventually took up the suggestion of his brother Theo, now a successful art dealer, to focus on painting. In 1880, he moved to Brussels and studied at the Royal Academy of Art. Van Gogh’s first major work, The Potato Eaters, was painted in 1885 shortly after his father’s death. Like many of his early works, the painting used sombre colors, especially dark brown, a preference which would make his paintings difficult to sell; buyers’ tastes were now influenced by the bright tones used by the Impressionists. His palette however, began to change after he moved to Antwerp in 1885. He studied color theory and began using carmine, cobalt and emerald green. But it was while living in Paris from 1886 to 1888, where he met Emile Bernard and Toulouse-Lautrec and came into close contact with Impressionist art, that Van Gogh’s art really began to develop. He experimented with Pointillism and painted in the sunflower-rich region of Arles with the artist Gauguin. By late 1888 his behavior was becoming difficult however, and fearing that Gauguin was going to abandon him, he stalked the painter with a razor before cutting off his earlobe and giving it to a local prostitute, telling her to “keep this object carefully.” The following year, after suffering from hallucinations and believing that he was being poisoned, Van Gogh was placed in the mental hospital of Saint-Paul-de-Mausole near Arles. 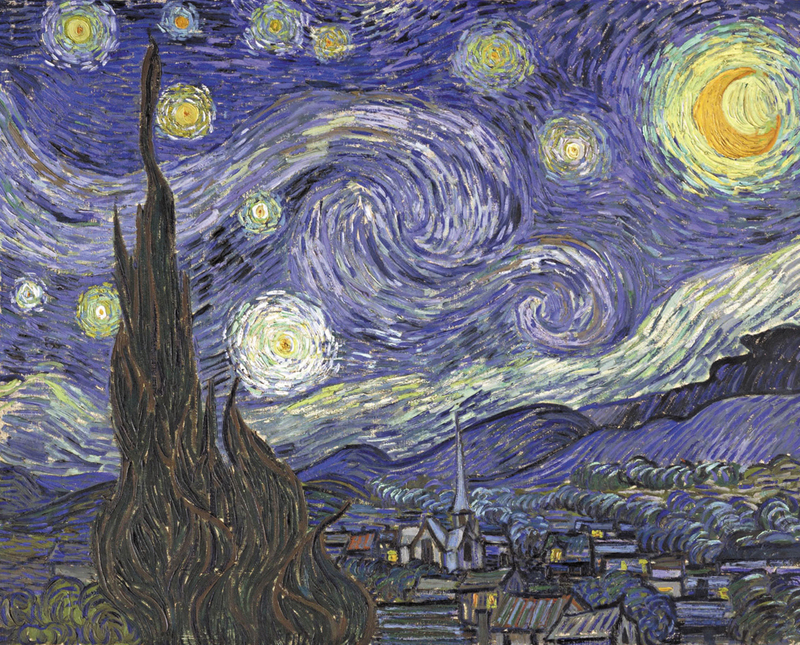 By now, Van Gogh’s work was beginning to be recognized. The critic Albert Aurier called him a “genius,” and Monet declared that his work was the best in a major avant-garde Brussels art show. The beginnings of success did nothing to help Van Gogh’s depression though, nor did the intervention of the physician Dr. Paul Gachet. On July 27, 1890, he walked into a field, shot himself in the chest with a revolver and died two days later. Although there has been much speculation about the nature of Van Gogh’s mental illness, he is now recognized as one of the world’s greatest artists and a bridge between 19th century Impressionism and 20th century art. You can find a great collection of Vincent Van Gogh patterns to use with SegPlayPC ™ here: http://www.segmation.com/products_pc_patternsets.asp#VVG. This entry was posted in "out of the box" art, 20th century art, art dealers, color theory, Emile Bernard, Gauguin, Groot-Zundert, Impressionism, mental illness, Pointillism, Toulouse-Lautrec, Van Gogh and tagged 20th century art, color theory, color therapy, depression, Emile Bernard, expensive pieces of art, expressionism, Fauves, Impressionism, Palette, Post-Impressionist paintings, Toulouse-Lautrec, van Gogh, Van Gogh's mental illness, Vincent Van Gogh on April 8, 2013 by segmation. Ah, a wonderful post to begin the week! Thanks – he makes you feel alive!